One of the healthiest soups is made with broccoli and that's what we are going to make today. This one is a bit spicy which can be moderated at will. Though I've made it with broccoli, you can add bottle gourd as well. You can keep the consistency of pureed broccoli either very coarse or completely smooth. You can easily refrigerate this soup for up to a day. Do not hesitate in adding finely chopped broccoli as a garnish before serving. Leftovers of this soup can be concentrated with added cheese or butter and can be used as a dip. A garnish with calendula petals used here is completely optional and can be replaced with your preferred one. 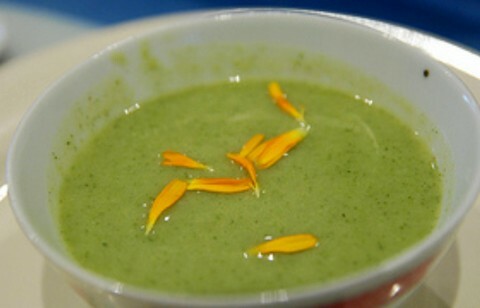 Let's make this nutritious soup preparation made with fresh pureed broccoli. Savor this appetizing and nutritious broccoli soup recipe which is delicately flavored with select seasoning ingredients for a nice and aromatic taste. Pulse broccoli pieces with enough water to form a smooth paste. Heat olive oil in a nonstick sauce pan. Add green chili paste with ginger paste and saute for half a minute. Add broccoli paste with cream and gently stir on a medium flame for about 3 to 4 minutes. Add vegetable stock and season with ground pepper, onion powder and salt. Simmer for about 15 minutes while stirring gently on a low flame. Add unsalted processed cheese and simmer till the soup reaches the right consistency. Garnish with calendula petals and serve hot.